eSmarts Team: I Just Love Swaps! My name is Jill Milan of Jewelry Elegance by jill and "I Just Love Swaps!" 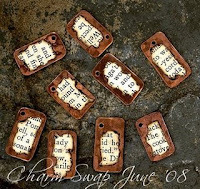 I must say I will not be a recipient of one of these beautiful and unique charms, Stacie and I belong to different swap groups, but she has given me much inspiration. Jill, I've never been part of a swap, but you make it sound like so much fun I might have to try it at some point! Teresa, My very first swap was an earring swap. My swap partner Diane did a beautiful pair of fringed earrings. The next two swaps were wire wrapped charms, and now I'm doing a wire wrapped pendent swap in August. Think I'll blog about them in the near future. I love these! Each one it's own unique work of art! I love swaps too. Its a great way to get something you may not know about or be game to try! I've only done one swap, but I loved it! I made my first wire wrapped pendant and swapped it, now I wish I could remember how I did it!